Granby’s greatest asset has indeed always been its rural beauty and farming heritage. It is this enduring beauty and small-town feel that has attracted a new population of admirers, many of whom have decided to set down their roots. Consisting of just two villages — North Granby and West Granby — Granby is the farthest north of all the Farmington Valley towns. It’s also the largest geographically, with 41.5 square miles of gently rolling hills, rugged countryside, and wide valleys. Find your Granby home here. A sleepy farming town until just after WWII, Granby began to grow when new neighborhoods arose near the center of town and adjoining hillsides became dotted with homes, more than quadrupling the population. That said, horses, llamas, goats and some of the last remaining dairy cows continue to graze here, and it’s the everyday sight of those gentle creatures grazing that drew — and continues to draw — many a new resident. Find your Granby home here. The town’s hub, Granby Center, lies at the junction of Routes 10/202, 189 and 20, where shade-grown tobacco fields have been replaced with a gathering of restaurants, service businesses, banks, and shops. This past year, Granby joined the culinary game with the opening of The Barn, owned by Jimmy Chen, also of the fine Asian restaurant Han just down the street. The seasonal Grass Roots Ice Cream, always handmade, pleases with unique flavors like Honey Lavender. A local winery and banquet facility are scheduled to open this spring — a welcome addition to town. Sweet Pea Cheese in North Granby is a delight to the cheese connoisseur. Geissler’s Supermarket, Beman’s Hardware, Granby Pharmacy, the post office, and Lite-N-Up Eatery have for a long time been the Center’s mainstay attractions. But these days, Granby Village Health, a gem for all things natural, Starbucks, CVS, McDonald’s, and several banks all coexist without cluttering the easy feel of things. Not to mention, Granby is still the cheapest place around to fill up your gas tank. The Town Green is regularly lined with hand-painted signs announcing the latest goings-on, like potluck suppers, elementary school concerts, football and soccer and baseball games, and the dog park fundraiser. And just north on 10/202, Granby Memorial Middle School, the Salmon Brook Ecology Center and Granby Memorial High School share a campus. Around the bend, Cambridge House Brew Pub, which names its award-winning brews for local landmarks, and the shops at Old Mill Pond Village attract visitors from all over the region. Heading north, the antiques, collectables and ephemera at the Salmon Brook Shops offer hours of peaceful browsing. East Street leads to North Granby Center, at the heart of which is the beautiful old Cossitt Library. Across the way sits the Allen’s old cider mill, a National Register of Historic Places landmark dating back to the 1750s — and the key reason Granby was the foremost distiller of cider for Hartford County throughout the 1800s. Adding to the village’s timeless appeal is Enders State Forest, the Garlic Farm, and Huggins Gorge, where Salmon Brook tumbles over the remains of several 1800s manufacturing sites. Heading north toward Granville, Massachusetts is the Lost Acres Orchard and Farm Kitchen, where handmade quilts, crisp apples and apple crisp abound, remaining a genuine “core” competency. And just down the street is Lost Acres Vineyards for the wine lover. And along Route 20 in West Granby is “The Farm” – Holcomb Farm. Deeded to the state by siblings Tudor and Laura Holcomb and ultimately passed to the Town of Granby, the old farm has been reborn thanks to a whole lot of volunteers, strong community support, and some very successful fundraising. These days, its 320 acres and miles of wooded trails are also home to the farm’s Arts and Environmental Learning Center, which not only brings local and inner city kids together for opportunities to learn, but also offers adult instruction, special programs, and community supported agriculture fields. Traveling east is the 400-year-old Dewey-Granby Oak — one of the town’s most treasured symbols, as well as Center Cemetery and Granby’s municipal complex. At the brow of the hill, in a beautiful old Victorian, is another town institution: The Granby Drummer. This all-volunteer newspaper was founded in 1970 to address a hot local issue, which it did so effectively that it has stuck around as the community’s free-of-charge newspaper ever since. South of the center, historic homes with their cool, maple-shaded lawns line “The Street,” a.k.a. Salmon Brook Street, and anchoring the neighborhood for almost a century are the South Congregational Church and parish hall, the gambrel-roofed VNA building, and the VFW hall. At the foot of the hill, Salmon Brook Park is home to the Granby Little League, Granby Rovers Soccer, a new recreation center, and the town’s very popular dog park. But its first claim to fame is perhaps more unique: it was once Doc Pendleton’s golf course, which took shape in the 1920s and attracted golfers from all over New England until WWII’s gas rationing caused its demise. Abutting the park to the south is the McLean Game Refuge, which covers 4,300 acres in Granby, Simsbury and Canton. The refuge was bequeathed to the state in 1932 by George P. McLean, who was both Connecticut’s Governor and a U.S. Senator — but not before he welcomed Presidents Coolidge, Taft and Hoover for fishing outings at the small chestnut-log cabin above the trout pond. The trails and quiet woodlands are enjoyed every season of the year by hikers and strollers, cross-country skiers, horseback riders, and runners in the Granby 10K Road Race. 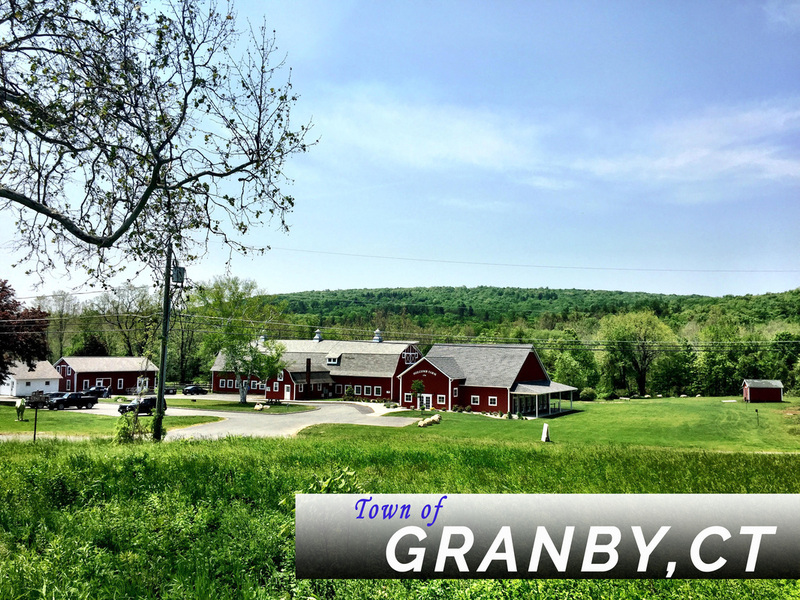 Granby has also experienced a spate of residential and commercial growth on its south border toward Simsbury where Stop & Shop, TJ Maxx, the shops and restaurants on Mill Pond Road, the Peppermill Deli and Bakery, and the 70,000-square-foot Farmington Valley YMCA have been added. 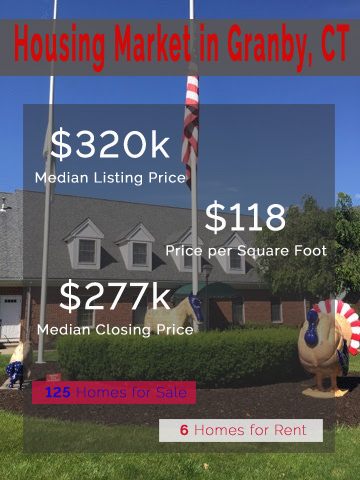 Find the perfect Granby home here.